The body of this pedal has been reinforced thanks to a new design and a more durable carbon material. 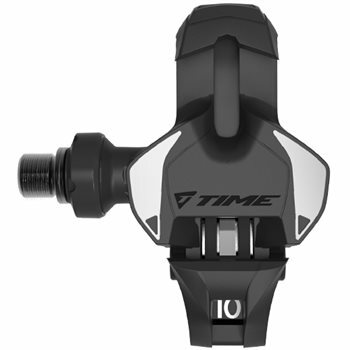 Power transfer and stability are improved with a pedal surface of 725mm2 – 25mm2 larger than the Xpresso (700mm2). The lower fairing was created to improve aerodynamics and protect the carbon blade. The Iclic system has been redesigned to allow for a more positive cleat engagement and to be more comfortable. The adjustable carbon blade has 3 positions of clip-fin tension. Like the Xpresso, the stack height is low, keeping the cyclist's sole as close to the center of the pedal axle as possible. This, along with the large pedal surface area results in incomparable pedaling efficiency and comfort. Automatic pre-opening of engagement mechanism for quick ‘step in’ engagement. Larger 725mm2 pedal platform for greater power transfer. Lower cover to increase aerodynamic and protect carbon blade. SENSOR Adjustment offers a personal ‘feel’ angular float . Q-Factor adjustment allows setting of lateral foot position. BIOPOSITION Concept provides minimal distance between sole and pedal axle. Angular float (+/-5°) and lateral float (2.5 mm).